Grapefruit Seed Oil is an acidic liquid citrus oil derived from the seeds, pulp and white membranes of grapefruit. It's rich with vitamin C and E! It's a natural anti-bacterial and anti-fungal agent. It has superior antioxidants that neutralize damaging free radicals. It has benefits for the body, skin and hair. CAUTION! 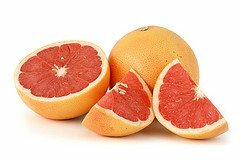 Always use grapefruit seed extract, (GSE), diluted. If you have citrus allergies do not ingest or use topically. GSE interferes with the way your body breaks down and metabolizes drugs. It can cause serious and life-threatening interactions with medications. If you experience any discomfort discontinue use. If in doubt, consult your health care provider before using grapefruit seed extract. GSE fights infections caused by viruses, bacteria or fungi. It enhances the immune system, detoxifies the body, lessens digest upset, lessens ear and throat inflammation, (caused by the flu) and is suggested to suppress the development of colon cancer. RECIPE # 1: TREAT A COLD OR FLU! -- Add two drops of, diluted, grapefruit seed extract to a nasal rinse. RECIPE # 2: TREAT GINGIVITIS! -- Combat bad morning breath! Gargle two drops of grapefruit seed extract in a 6 oz. glass of water. RECIPE # 3: TREAT NAIL FUNGUS, FOOT FUNGUS AND JOCK ITCH! -- Mix two drops of grapefruit seed extract with water. Soak affected areas. Rinse, thoroughly, with warm water. Gently pat dry. --- Never use GSE at full strength. Always use diluted. Over use can dry out skin causing irritations. It can cause a burning sensation to eyes. If you happen to get it in your eyes, flush out with cool water and clean. --- Those with sensitive skin may want to avoid GSE. If in doubt, contact your dermatologist. If you have a citrus allergy do not ingest or use topically. --- If skin becomes red, inflamed, irritated or develops a rash discontinue use, immediately. You may notice a tingling sensation at the time of application or after rinsing off. This reaction is normal and will slowly dissipate. GSE has anti-bacterial and astringent properties. It helps get rid of blackheads. It's a natural cleanser that removes dirt and oil trapped in the skin. It dries up oil secreted by the sebaceous glands. RECIPE # 1: (Combat Acne) Splash warm water on face. Gently massage two to three drops of diluted GSE on face. Avoid eyes, ears, nose, mouth or any other sensitive areas. Rinse face, thoroughly, with warm water. Gently pat dry. (You may have a slight tingling sensation. This is normal). RECIPE # 2: (Cleanse & Combat Acne) Add two to three drops of diluted GSE to a gentle facial cleanser. Massage into skin, gently, Avoid eyes, ears, nose, mouth or any other sensitive areas. Rinse face, thoroughly, with warm water. Gently pat dry. RECIPE # 3: (Get Rid of Blackheads) Mix one drop GSE with one tbsp. water. Apply directly to affected areas with cotton ball or other clean surface. Leave on for five to ten minutes. Rinse affected areas, thoroughly, with warm water. Gently pat dry. GSE helps get rid of dandruff. It fights bacteria, rids debris from hair follicles and encourages new hair growth. When hair is weighed down by dandruff or chunky dry flakes, hair follicles are clogged. This can inhibit new hair growth. RECIPE # 1: Add two or three drops of GSE to your shampoo. Massage in scalp and leave on approx. two minutes. Rinse hair thoroughly. Let hair dry or gently towel dry. Avoid using hot air blow driers. Blow driers can weaken hair, causing it to break or split. There are pros and cons to using GSE for making soap. GSE can give your homemade soap a longer shelf life. Instead of using a harmful artificial preservative, it's a better choice. It's excellent for preventing rancidity. If you plan on storing your homemade soap for long periods of time than it's important to use some form of natural preservative. Store GSE away from sun exposure. Otherwise, it will decompose quickly. Contrary, your homemade soap may need a preservative. Ask yourself, "What's in my soap that I need to preserve?" You may reconsider using GSE. You may decide to stop and save your money, instead. MAKING SOAP TIP # 1: Blend GSE into your homemade soap recipes. Add from 1% to 4% of your total ingredients to your soap making oils before you add lye. MAKING SOAP TIP # 2: CAUTION! GSE can cause accelerated trace and react with other fragrances, causing soap to seize. Seized soap is like mashed potatoes and is never a good thing. If this happens, it's best to just throw out the batch and start making soap all over again.